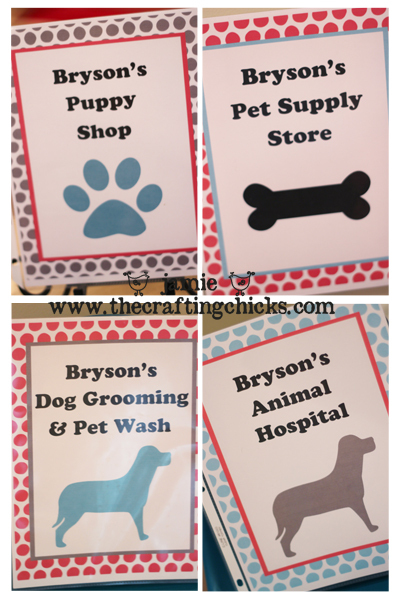 I am soooooo excited to share my little boy’s PUPPY SHOP Party with you today! I have been wanting to post it since last fall. My little boy Bryson is in LOVE with all things puppies, especially polka-dot ones (dalmations). So for his 4th birthday party, it was a must that we celebrated by having his friends come to his “Puppy Shop.” It was a huge hit and Bryson was in heaven. So many details to share…so let’s get started. 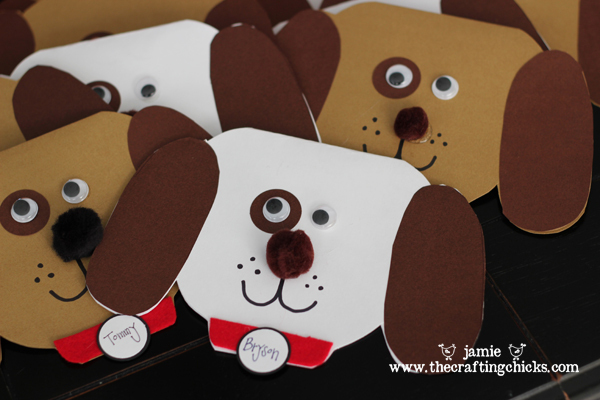 First off, we made some very cute puppy invitations. I folded white and brown cardstock in half and just kind of cut out the shape of a dog head. Added some dark brown cardstock for ears, a brown circle for the spot, red felt for the collar, a brown pom pom for the nose and google eyes! I also added some dog tag circles and wrote the guests names on these. “Woof! Woof! You must stop! to Celebrate Bryson turning 4! 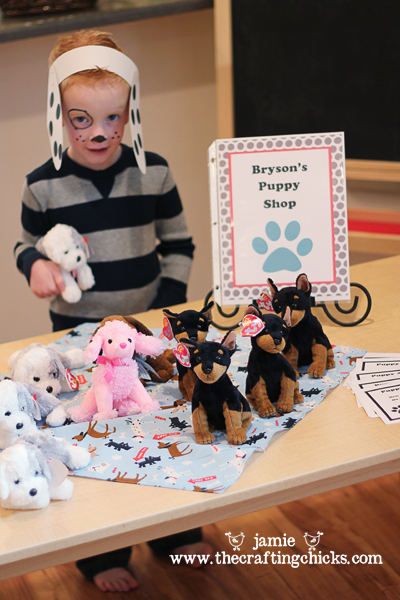 Bryson and I had so much fun setting up his puppy shop the night before. We had 4 stations. 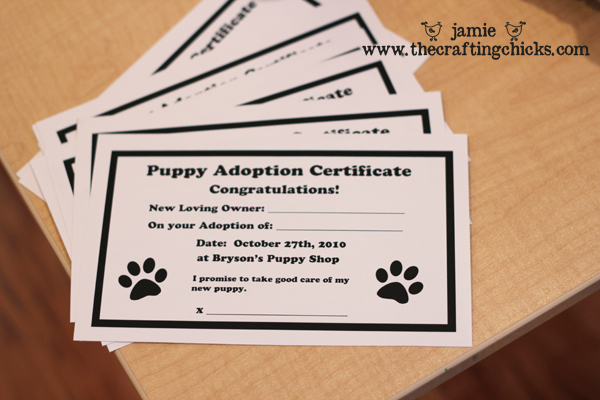 When the boys arrived, they first stopped at the Puppy Shop where they chose their puppy and filled out their puppy adoption certificate. They loved being able to choose a name for their puppy. It was so fun to see how excited they were to choose a puppy. Next stop, the Pet Supply Store. The boys were able to pretend they were vets. I had a few play doctor kits set out. (This was so cute) They each got a bottle of doggie Vitamins to take home (gummy bears). Last stop was the Dog Groomers where I had some doll bathtubs, brushes, sponges, and yummy spray. Bryson’s friends also stayed for lunch. It was a perfect fit to serve hot dogs! 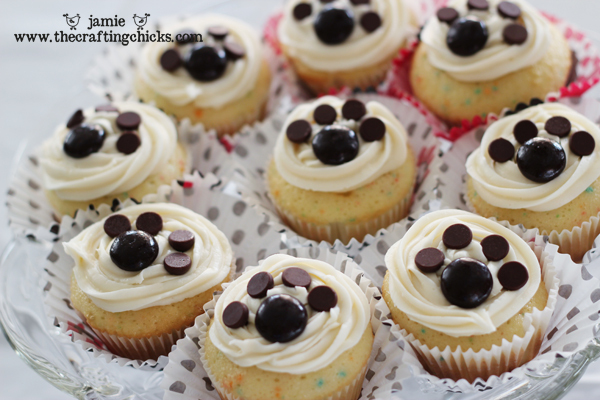 To make the pawprints on the cupcakes, I used junior mints and chocolate chips. 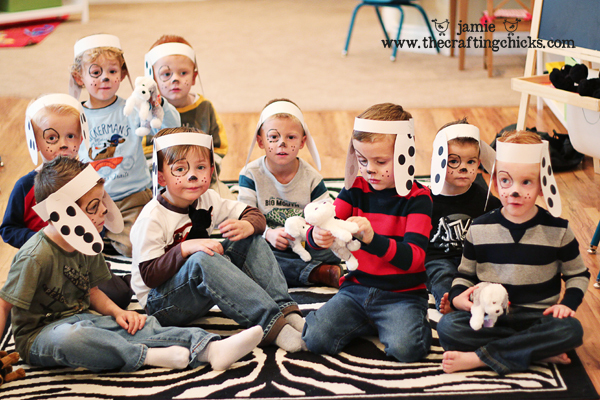 We also turned each boy into a dalmation! These dog headbands were super easy to make! We painted on spots and black noses! How cute are these little puppies! -Who stole the Puppy bone? (someone steels a dog bone from under the Puppy’s (players) chair, while he is closing his eyes and turned around, and then the Puppy guesses who stole it) They loved this game.This party was a huge success (and a lot of work)! I think we will take a break next year! Bryson carried around his puppy and supplies for days! 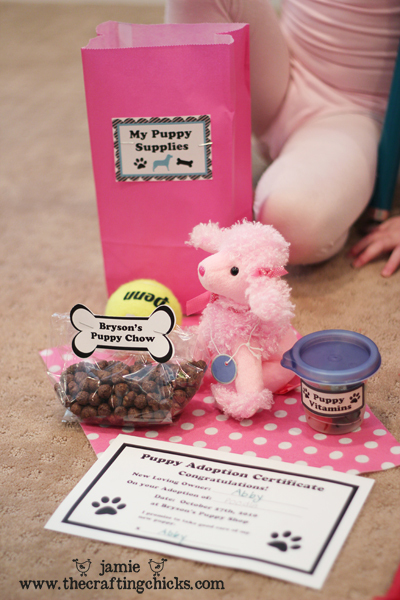 We even had a special little pink poodle for his twin Abby! (Her princess party to follow soon!) Needless to say we were partied out! Oh, I almost forgot! 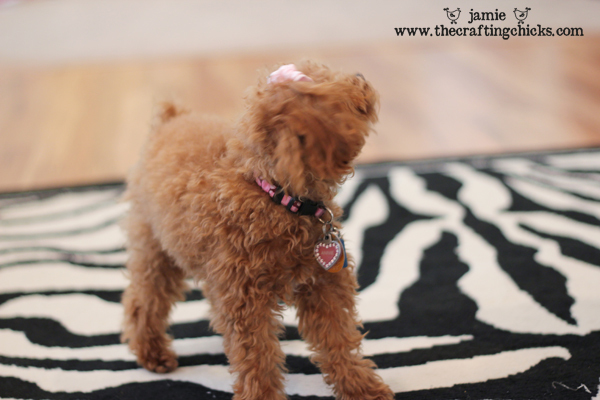 We did have a special guest too-little Annie, a very cute toy poodle that did many a tricks! Cutest thing ever! Good heavens! This is so doggone cute I can hardly stand it! You are like the creative genius of the planet! What a Happy Home you have indeed!! Thanks for sharing! THIS IS TOO CUTE! I am such a dog person, so this just melted my heart! I’m filing this idea away for when I have kiddos of my own! Absolutely darling! You did such a great job. Well thought out and executed! WOW! You are amazing! Thanks for sharing! I may have to throw a puppy birthday party after all! Fantastic! I read every detail and smiled at every picture! My son is 24, so I won’t be throwing this party (can you imagine? ), but I will pass this on. Love it! THAT is the CUTEST puppy birthday party I have ever seen! You thought of it all!!!! I love it!!!! So adorable!!! I don’t have kids yet, but I am keeping this in mind, it is just too cute. Oh my goodness! This is adorable! 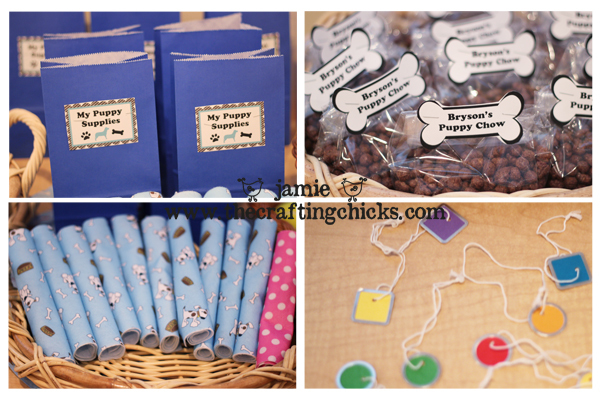 I was already planning on a puppy dog party for my little one’s 2nd birthday and have the menu down but wasn’t sure what I was going to do as far as games, favors and such… This is just fantastic! wow! what a super cute idea!!! this is the cutest thing ever! I may have to use (some) of this!! what an amazing and adorable puppy party! Too cute and perfect for my dog-loving granddaughter. Where did you find your dogs? We found some very cute Yomiko Classics puppies (lots of breeds) at Hobby Lobby, but at $6 each I am going to have to print off lots of their 40% off coupons and run every member of the family through the checkout lane. Six year old M. is also a major crafts girl so we decided our primary activity, after adopting puppies, will be decorating shoebox doghouses. Stopped in at Payless Shoes and they gave us plenty of free (kid-size) boxes. Where did you get the darling blue and white striped shirt? So cute! Funny that we’re both blogging about puppies at the same time. LOVED the puppy party! Such a cute idea, I am definitely filing it away for future reference. Btw my son’s name is Bryson (he’s 2) and I never meet anyone with that name. That is just the cutest thing *EVER*. My little guy loves puppies. We just might have to do this this year. 🙂 Thank you so much for sharing. Can you tell me how you managed to print the invitation on the puppy shaped paper? Love it! You are so creative! What a wonderful idea. 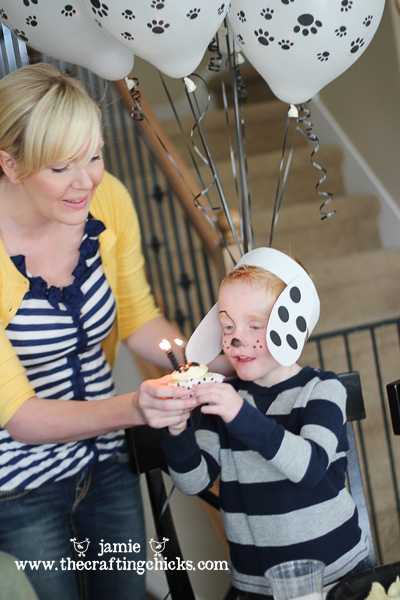 This is the cutest birthday party idea ever! All your ideas were clever, looked easy to create, and seemed affordable. You definitely inspired me to come up with some great ideas for my son’s 2nd birthday party this summer. Thanks for sharing! LOVE IT!!! Where did you get the paper for the station signs? Did you just print it off, or did you scrapbook it? 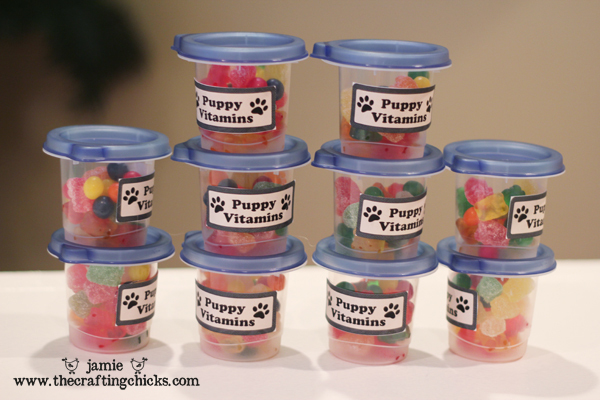 Also, any way you could share the printables for the puppy chow, puppy vitamins, etc? This is ADORABLE! I love your creativity! Jamie, Thank you SO much for posting this! After reading it, I decided that my little guy who will be 5 next Saturday HAD to have a puppy party! We are getting ready and are all SUPER excited!! (I think that I might be even more excited than my son!!) 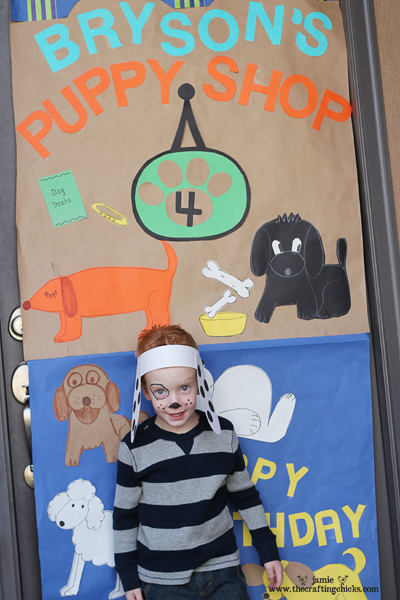 It is such a great idea and we are really looking forward to our puppy party! Thanks again!! Cute! I can’t wait to show my little guy who wants a puppy party! He will love these ideas! Thanks for the great ideas! I used some for my daughter’s party this weekend. We also colored paper snow cone hats to make party hats for the stuffed puppies. These are so cute!! I was wondering if you have printables of everything to share. My daughter has asked for a puppy party next month and I love what you have created! LOVE this!! We’re having a puppy party for my daughter’s 2nd birthday. Where did you find those little puppies? We’re going to have a lot of kids and I’m trying to keep costs down. 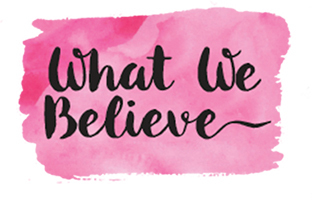 Also, do you have the files for any of your printables that you’d be willing to share? Kent, I did a puppy party for my son last year (after seeing this post!) and I did it all on my own. I got the stuffed dogs at Walgreen’s for $1.99 each. I printed all the signs and adoption certificates on my own computer using Word. I also did the invites on the computer. I have a Cricut die cut machine and did a big poster for my front door. 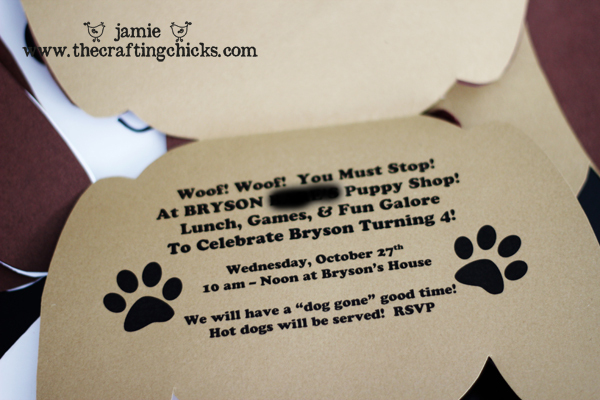 But, I also went to Archiver’s (a local scrapbook store) and made die cuts of dog houses for front of the invitations. The party was SO much fun to do and the kids all seemed to love it! Good luck with your party! Thanks Michelle!! I will have to go play on word and see what I can come up with!! We are doing my daughter’s party at a park, so I think I’ll just dedicate one of the picnic tables to that. I will go check out Walgreens – good idea! I was going to check Dollar Tree as well! 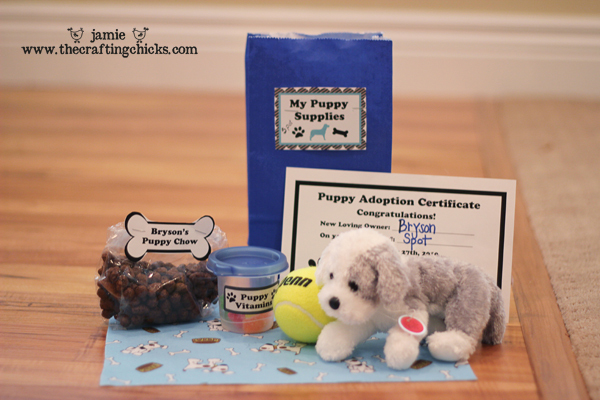 Do u have a template for the adoption certificates and the bone labels? I LOVE your site and ideas! Came across this tonight on Pinterest while finding ideas for my daughter’s 6th birthday party in June. We are doing a puppy theme because she is asking everyone to bring a donation to our local humane society instead of gifts for her — we will be using many of these! Thank you for inspiring us! What a great party you had! 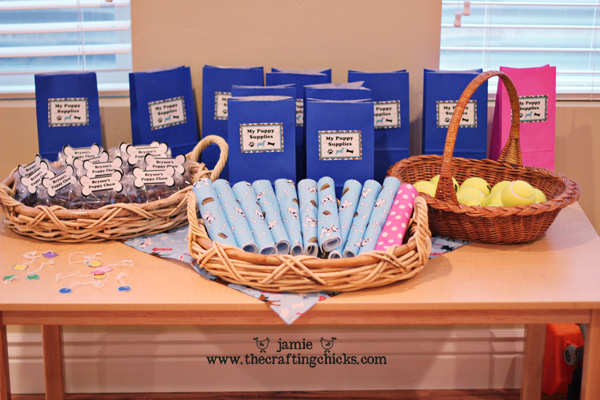 My kids always have themes for their parties and I know all the time and effort it takes for each detailed item. You did an amazing job! My daughter had a pink poodle party for her 5th birthday, but now that shes turning 7, she wanted a “DOG” themed party again, but something different this time. I think this is PERFECT for what she is wanting. We wont be able to follow it to the T, as we currently live in China and party supplies are hard to get unless you are looking for Chinese New Year or Wedding themed items… that may have to be the theme one year. hahaha. Thank you for all the great ideas and for posting them with such detail. You’ve got two very lucky kiddos! Thank you sooooo much! I was looking for ideas for my daughters 8th birthday. she loves puppies. This is great. Adorable!! Do you happen to have any of the labels downloadable or printable? I am throwing my little guy a puppy part and I love your signs and labels.